OptinMonster comes with the powerful exit-intent technology which allows you to display your campaign at the precise moment when a user decides to leave your site. Using this with a lightbox popup produces great results and will dramatically increase your email list signups. Here is how to activate Exit-Intent in OptinMonster. REQUIREMENTS: Exit-Intent requires a Pro Subscription. What is the Exit-Intent Sensitivity Setting? In the Builder, select the Display Rules tab. Next, within the Conditions section, set a rule to exit detected. If you want the campaign to only show on exit, you will want to remove certain action and time-based triggers, like the time delay, scroll, and inactivity triggers. However, if you want the campaign to show on exit OR another trigger (e.g. on exit OR after 30 seconds) then you can use the + Add a new ‘OR’ rule button. Now is also a good time to configure where your campaign should load using rules like current URL path. Once you have finished configuring your conditions, don’t forget to also configure your actions. 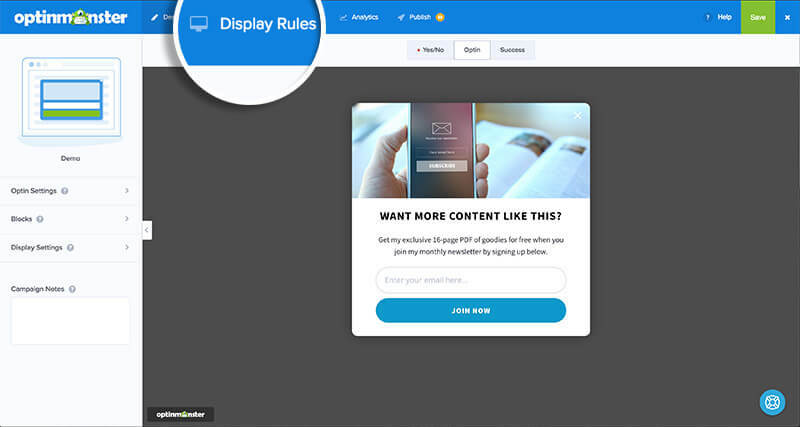 NOTE: Learn more about how to use OptinMonster’s powerful rules engine to control when and where your campaign should load on your site by reviewing our display rules documentation. Interested in maximizing your conversion rate? See how Crossrope exploded their list 900% each month with Exit-Intent! Q: What is the Exit-Intent Sensitivity Setting? A: The exit Sensitivity setting controls how far away from the top of the browser the user’s mouse must be before the campaign is triggered. The sensitivity can be set to Low, Medium or High sensitivity. For example, High sensitivity will cause the campaign to be triggered when the visitor’s mouse is further away from the browser than a Medium or Low sensitivity setting would. A: No. Exit-Intent will not trigger campaigns on mobile devices. As an alternative, you can utilize the Inactivity Sensor rule to trigger campaigns for mobiles devices. This rule allows you to show the campaign when a user has stopped all activity, including clicking and scrolling, for a given amount of time. You can add this using the + Add a new ‘OR’ rule button to show on either exit or inactivity, whichever trigger occurs first.